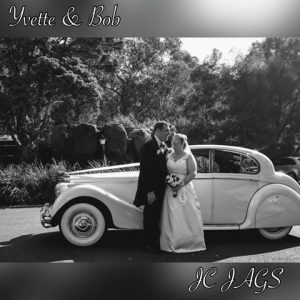 Yarra Valley Wedding Car Hire - Yvette and Bob Tie the Knot! Yarra Valley Wedding Car Hire – Yvette and Bob Tie the Knot! Autumn is a beautiful time to say “I Do”, as Yvette and Bob found out. The bright April sun reflected the joyful glow of the bride and groom on their big day, and brought the best out of their photos. With classic Yarra Valley wedding car hire as the perfect prop, there were smiles all round. Beginning with their wedding ceremony at the picturesque Bram Leigh Yarra Valley Weddings in Croydon, Yvette and Bob drove in style to their reception at Potters Receptions, Warrandyte. The Yarra Valley region provides a stunning backdrop for a scenic drive, amazing photo opportunities with their many wineries, and a day celebrating love! Yvette and Bob chose the classic 1950 Jaguar MK-V Sedan for their Yarra Valley wedding car hire. Vintage style, paired with modern comforts, this is one of Australia’s most popular wedding cars! The Jaguar Mk-V sedan has deep comfortable seats that can accommodate up to four passengers in style and comfort – with plenty of leg room to fit the largest bridal gowns with ease! When you choose to engage JC Jags as your wedding transport provider, you can guarantee that you’ll travel in luxury and style. Your Yarra Valley wedding car hire includes a chauffeured transfer from your designated starting point (like the Bride’s home) to the ceremony location, photography session and then onto your wedding reception. So if you want to take advantage of the Yarra Valley’s romantic surrounds on your special day, contact JC Jags. Let your journey be as magical as your destination!